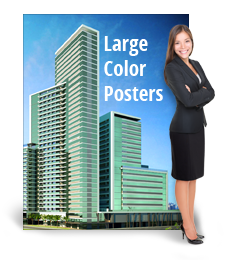 One of our newest products is large sized posters. For those who want to make a bigger impression, we now offer posters up to 3 x 8 feet! We offer full color printing, a selection of paper stocks, and the option to have them printed on one or both sides. You can now order large sized posters in small quantities. You can even order quantities as few as 1 piece! Do you need to advertise a special event, a concert, or an unforgettable night in the theater? Get the word out on a custom printed poster. How about featuring a new product or service? Posters make a splash! Are you moving? Get a great shot of your new location and go big to let your customers know where you are going so they can meet you there. Are you branching out, taking a bold new step in your business? It’s great you’ve got the new brochure, the new letterhead, the attention-grabbing post cards, but now, say it up big on a poster. Posters will attract viewers. Consider all the online marketing tools and social media outlets that Hollywood has now and yet every theater still has large, colorful posters to grab the street traffic. Add a QR code and you could lead all that traffic to your website too.